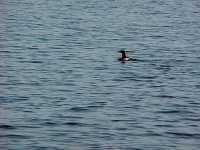 -----One of the great joys of the cruising life is the proximity we have with wildlife. Our wild neighbors are often noisy, like the dawn chorus from the Gull Island, but always interesting and enjoyable. 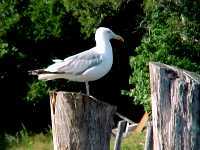 -----It might come as a shock to those who are ornithologically-challenged that there is no such thing as a Sea Gull. 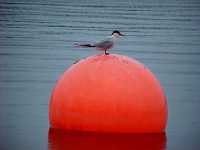 Such a presumption leads one to believe that there is a Land Gull. Indeed, some individual gulls may never see the ocean in their lifetimes, but their species is always well-represented on a coast somewhere. No, there are no Sea Gulls. There are Herring Gulls, Laughing Gulls, California Gulls, Western Gulls, and many other species, but no Sea Gulls in the bird books. -----Knowing the names of things around us serves many purposes. For starters, we can be smart alecks to ex-friends and neighbors with incessant trivial knowledge. Or, less obnoxiously, names allow clarification in identifying. Instead of saying, "Good Morning, Human," we can say "Hi, Beth." We think Beth would appreciate it. Also, we can then differentiate and individualize the experience of meeting another human. We have added diversity and appreciation to our lives, enriching our experience. -----For El and I, cruising the beauties of America without knowledge of the natural world would be a great loss. Knowing something about the rocks, birds, plants and animals, and the human culture and history adds not only to the pleasure of our cruise but is the essence of why we cruise. Not knowing and appreciating our natural and human surroundings would be like visiting the Metropolitan Museum of Art with the pictures turned to the wall. ------Please appreciate this picture. 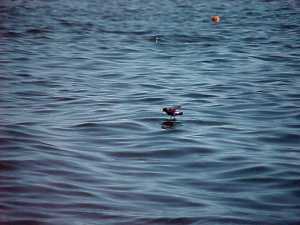 Those of you who know the Storm Petrels, know that they are among the flightiest flits of the bird world. This was a dumb lucky picture. They fly like swallows at sea, descending to the surface to "walk on the water," picking off tiny morsels from the wave tops. They are found all across the oceans, tiny bits of feathered fluttering fluff thousands of miles from land. The old "saylors" called them, "Mother Carey's Chickens." 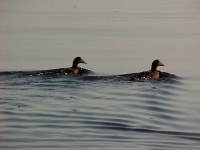 They considered them Virgin Mary's brood due to their habit of seemingly walking on the water. -----OK. Some "Sea Gulls." 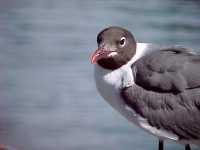 This is the Laughing Gull. They are well-named. We have awakened to their chorus and thought we were in bedlam. 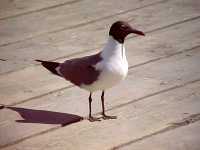 There are many species of black-headed gulls, so check them out. 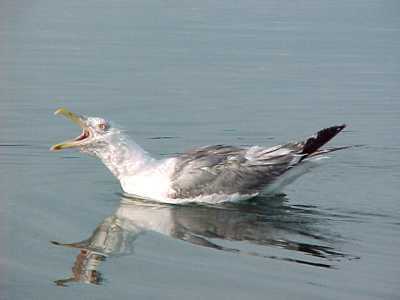 -----The Herring Gull is the common gull of the Atlantic Coast. 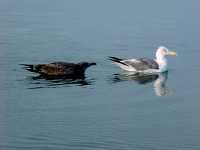 The dark bird following the adult is a teenage Herring Gull trying to beg food from its parent. Some things never change, in the bird world or ours. 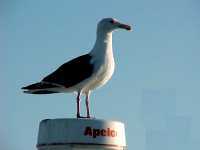 -----For those of you on the west coast, you have a counterpart that looks similar but is, indeed, a different species - the Western Gull. Both the Black-backed and Western Gulls are considerably larger than other gulls, and although generally less numerous, are the Kings of the Roost. 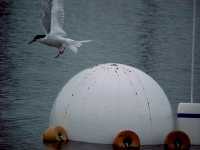 -----Terns are the swallows of the water world. They have long pointed wings and pointed tails. Their flight is often erratic but graceful. 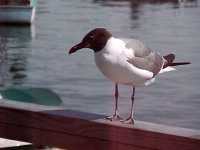 They are generally smaller than gulls and "pointed." Watching their aerobics is exciting. 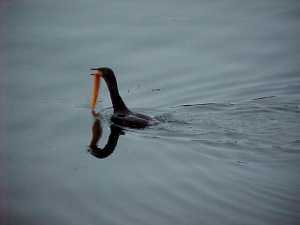 -----There are various species of cormorants, on both coasts, but this is the common one in Maine. They eat fish and, like this fellow, eels. They have long serpentine necks and dive from the surface of the water to pursue their prey. They are 'groupies' and often occur in very large flocks. One dark night, navigating across a southern lake, my eyes were riveted to the instruments and El's to the water ahead, when she suddenly shouted, "Stop." Never has a C-Dory gone into reverse faster. Ahead the water was boiling white - thrashing and jumping - across a strip a hundred yards wide. "Good Lord - a rapid? A waterfall? - in the middle of a lake?" We watched the tumultuous white froth spread and then mysteriously dissipate. Thousands of frightened cormorants had pattered across the water to take flight ahead of our approaching bow. 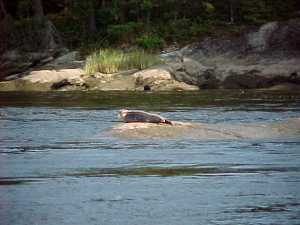 -----This one is on its nest on the North End of Swan Island in the Kennebec River, upstream from Bath, Maine. 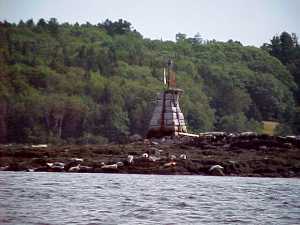 The first European colonists were told by the Natives that this was Eagle Island. 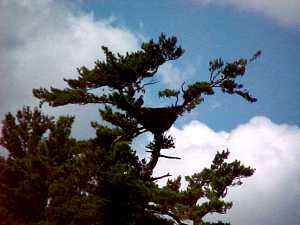 Eagles had lived there as far back as tribal memory extended. They still do. 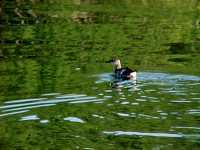 -----These are (in summer plumage) small black and white diving birds. Big deal, you say. Well, listen up. These little critters live in the High Arctic - places like Baffin Island and the Northwest Passage. They nest and feed along the edges of permanently frozen land and ice. Their neighbors are Polar Bears and Inuit. Some stay in the Far North over the winter. They feed under the ice, emerging at the surface for air at seal breathing holes. 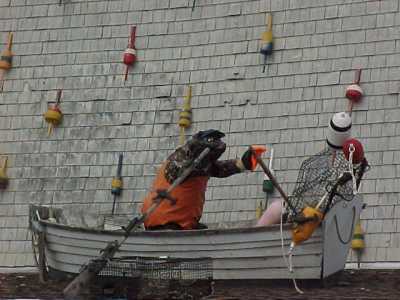 A few (the wimps of the species, I suppose) fly down to the 'warmth' of coastal Maine to spend the winter. Give them a little respect. -----These are also birds of the far northern tundras and arctic islands. Their feathers are exceptionally warm to shield them from the severe cold of the north. Those feathers make marvelous pillow stuffings. 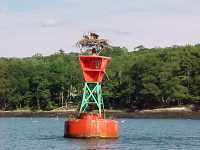 -----The earliest European settlers in this area reported Ospreys on the Pulpit. This nest has been continuously occupied for hundreds of years. Ospreys, or Fish Hawks, were threatened with extinction 30 years ago. DDT, washing down rivers from farms, was ingested by fish. 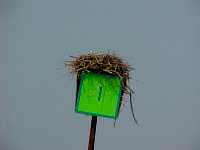 Ospreys ate the fish and concentrated DDT in their organs. The result was paper-thin egg shells and no young Ospreys. -----Rachel Carson, a Maine coastal resident and marine biologist, warned of the "Silent Spring" coming from pesticides. My Dad, a chemist and maker of pesticides, shifted away from DDT and to chemicals that did not endanger birds. Because of the effectiveness of government controls and the actions of chemists, today there are Ospreys everywhere along our eastern seaboard. 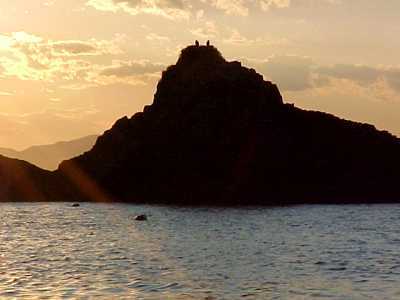 Their whistling calls enliven and cheer the coves and bays, and their nests festoon cruising marks, trees, and rocks. 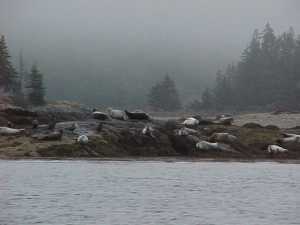 -----Harbor Seals were once killed by fisherman who considered them competitors. 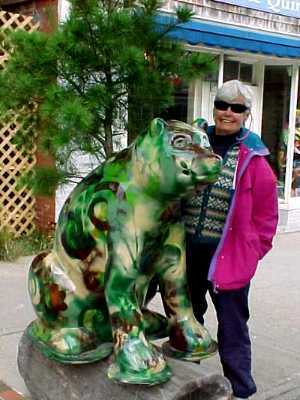 They have returned in great abundance along coastal Maine. Their plaintive calls add a melancholy touch to the gathering twilight of sundown anchorages. 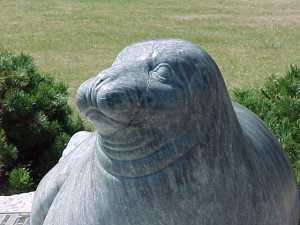 -----This is André , a seal who adopted Rockport, Maine. 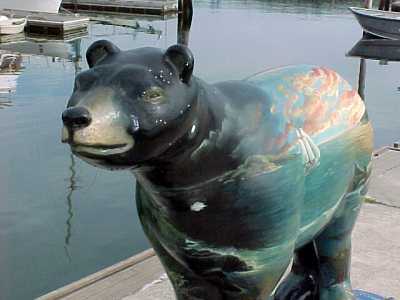 He greeted returning ships and graced the rocks of the harbor for years. 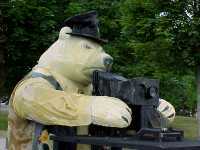 He was the delight and 'friend' of thousands of children and a tourist attraction. 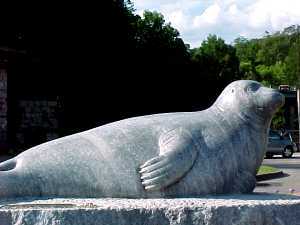 After his death, this marvelous sculpture was placed in the park beside the beautiful town dock and park to perpetuate André's memory. 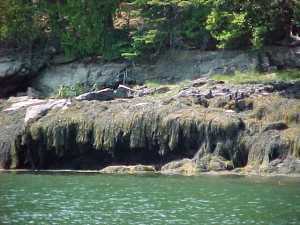 -----Marine plants and algae are abundant along the coast of Maine. Don't underestimate these 'weeds.' The tallest plants, from base to crest, are not the Redwoods of the West. They are Giant Brown Kelp. Since El and I consider ourselves to be weeds, we empathize with the sea weeds of Maine. (On the Appalachian Trail, through-hikers assume names - we were The Tumbleweeds). 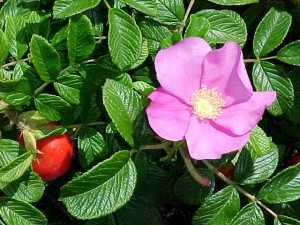 The Wildrose is a weed along coastal Maine, and the hips can make a delightful tea. -----The forests of Maine are legendary. Giant trees made the masts and spars of His Majesty's Royal Navy (and of our first Continental Navy). 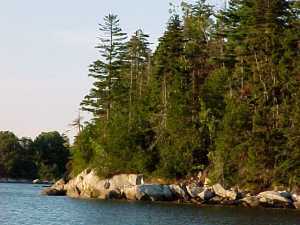 Many species of Pines, Spruce, Hemlock, Cedar, and Larch festoon the islands and shorelines, except some areas where salt spray and storm have burned off all trees. 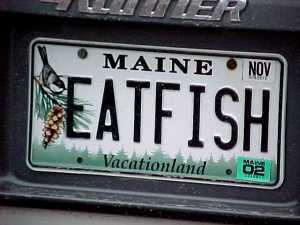 Yes, you can tell you are in Maine. 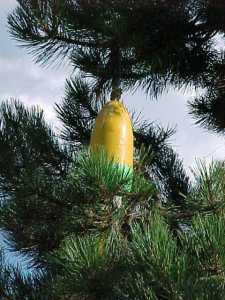 Only here do the pines bear such brightly-colored cones. -----Ah, yes - and we did! Wehad so many haddock this summer that our stomachs rise and fall with the Penobscot Bay tides. 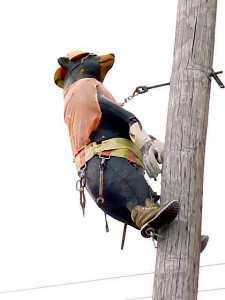 A Bear?? 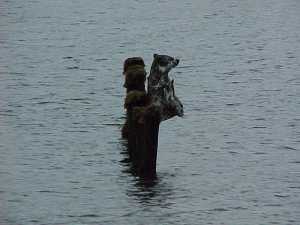 -- on a piling? -----We spotted this person on the water's edge while cruising into Winter Harbor. Fortunately, we save our sundowners until the hook is set - otherwise we might have cataloged this fella into the Pink Elephant category.